One of the rationales for the use of vasopressin in septic shock has been its potential cardioprotective mechanisms. Lower heart rates, higher arterial pressures, and fewer norepinephrine doses during vasopressin therapy were hypothesized to protect the heart from myocardial ischemia. In a prospective sub-study of the VASST (Vasopressin in Septic Shock Trial) project, Mehta and colleagues specifically evaluated this hypothesis but failed to find lower cardiac biomarkers or fewer ischemic electrocardiogram changes in patients receiving vasopressin compared with subjects receiving norepinephrine alone. After recent evidence of a lacking survival benefit, the present study results further challenge the future role of vasopressin as a vasopressor in septic shock. In a previous issue of Critical Care, novel insights into the effects of vasopressin in septic shock are presented . Throughout the last 15 years, vasopressin has experienced a lively history as a vasopressor in critical care (Figure 1). During a time when the intensivists' belief in the beneficial effects of vasopressors and (sub)normal arterial pressures on tissue perfusion remained unchal-lenged, vasopressin was propagated as a non-adrenergic vasopressor in various shock states. This evolution was fostered by an unrestricted sedation regime accepting over-sedation and, in turn, additional vasodilation. Today, the approach to vasopressors and tissue perfusion has dramatically changed given our evolving understanding that macrocirculation and microcirculation correlate only poorly in sepsis. This may explain why a multi-centered randomized controlled trial  and meta-analysis  failed to detect a mortality benefit of vasopressin in septic shock despite increasing arterial pressure and reducing norepinephrine doses. One of the principal rationales for vasopressin use has been its non-adrenergic mechanism of action . A substantial decrease in heart rate in response to vasopressin promoted the hypothesis that vasopressin protects from myocardial ischemia. 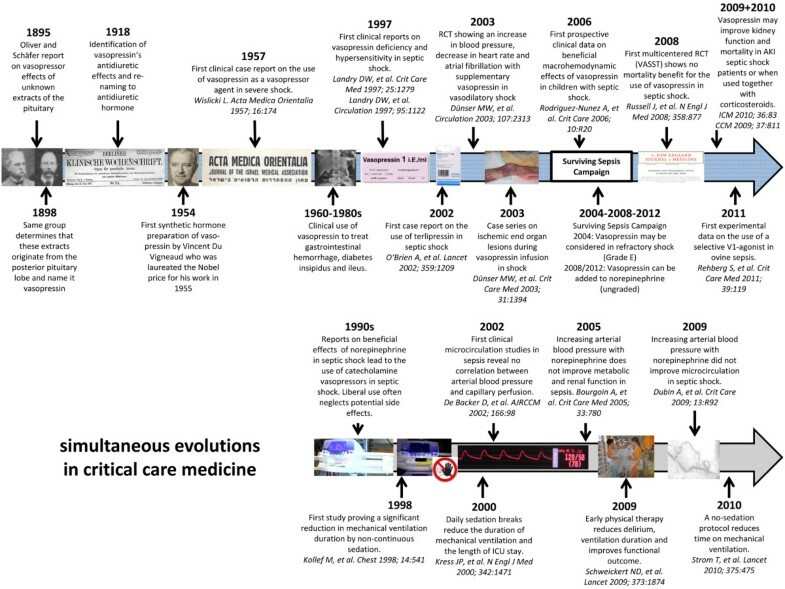 Timeline of the history of vasopressin, its evolution as a vasopressor agent, and important changes in critical care practice in the last 15 years which have influenced the role of vasopressin. AJRCCM, American Journal of Respiratory and Critical Care Medicine; AKI, acute kidney injury; CCM, Critical Care Medicine; ICM, Intensive Care Medicine; ICU, intensive care unit; RCT, randomized controlled trial; VASST, Vasopressin in Septic Shock Trial. This hypothesis was specifically tested by Mehta and colleagues in a prospective sub-study of the randomized controlled Vasopressin in Septic Shock Trial (VASST) . In 121 patients, heart enzymes and 12-lead electrocardiograms (ECGs) were measured during early septic shock to compare vasopressin and norepinephrine; 21% to 36% of patients showed elevated troponin levels, and there were no inter-group differences. ECG changes suggestive of myocardial ischemia were recorded in 48% of patients, and there were no differences between groups . In line with the study's inclusion and exclusion criteria, the results are restricted to myocardial ischemia in septic shock patients with a low to moderate coronary risk profile. Patients with acute coronary syndromes or de-compensated heart failure were excluded but made up only a minority of the total septic shock population (15%) screened for eligibility in the VASST project. Given that patients with elevated troponin levels in the present study had a higher rate of underlying ischemic heart disease than patients with normal cardiac biomarkers, it cannot be excluded that a combined vasopressin/nor-epinephrine infusion reduces the rate/severity of myocardial ischemia in patients with a high coronary risk profile . The authors are to be congratulated on a well-conceived and thoughtfully analyzed study. Hemodynamic data shown in the supplementary material reveal that patients given vasopressin exhibited lower heart rates and norepinephrine doses and higher arterial pressures, confirming that the study population met all criteria to adequately test the postulated hypothesis. Aside from certain limitations (for example, non-standardized measurements of troponin), a potentially relevant shortcoming is the comparatively small population of patients. Although theoretically the study may be underpowered to detect a significant inter-group difference in troponin levels of 0 to 0.2 μg/L, it is questionable whether such a difference is clinically relevant and whether inclusion of more patients would have increased the practical relevance of the results. Another noteworthy finding of this study is the observation that an elevation of cardiac biomarkers or ischemic ECG changes was not independently associated with septic shock mortality but that disease severity assessed by the APACHE II (Acute Physiology and Chronic Health Evaluation II) score was. This is in contrast to earlier studies. As suggested by the authors, the key difference between their study and most previous studies is the adjustment of the statistical analysis for disease severity. Thus, the prognostic value of troponins in septic shock may still be preserved, but the contributory role of myocardial ischemia to septic shock outcome has become seriously questioned by the present results. The 2012 Surviving Sepsis Campaign guidelines include an ungraded statement that vasopressin can be added to norepinephrine with the intent of raising mean arterial pressure or decreasing norepinephrine . Given that vasopressin-mediated increases in arterial pressure to (sub)normal values are unlikely to improve tissue perfusion  and may even result in end-organ hypoperfusion in case of microcirculatory failure , the role of vasopressin to increase arterial pressure in sepsis can be challenged. Although a vasopressin-mediated reduction of high norepinephrine doses may have more effects than simply decreasing heart rate , the present study results also question this rationale. Has vasopressin finally lost its justification as a vasopressor in septic shock? It is defi nitely premature to announce vasopressin's funeral in sepsis management. However, it is time to realize that there might be shock states other than sepsis in which vasopressin is more likely to exert beneficial effects. Scientific data [9–11] and clinical experience indicate that postcardiotomy vasodilatory shock could be such a state. Although the macrocirculatory responses to vasopressin in septic and postcardiotomy vasodilatory shock are comparable , the underlying microcirculatory pathologies are likely to differ dramatically. Severe microcirculatory dysfunction in sepsis may predispose patients to vasoconstrictor-induced aggravation of tissue hypoperfusion, whereas better preserved microcirculatory integrity in postcardiotomy vasodilatory shock  may allow improved tissue perfusion in response to a vasopressor-induced increase in arterial pressure. So, let us not despair of the waning star of vasopressin in sepsis, but let us focus on what really matters in shock: reversal of tissue hypoperfusion instead of correction of macrocirculatory deviations . Vasopressin is not lost, but it seems we have to use it where it is likely to affect tissue perfusion more favorably than in septic shock! This could be the case in pathologies with homogeneous vasodilation and a low grade of microcirculatory dysfunction, such as postcardiotomy vasodilatory or anaphylactic shock. Vasopressin in Septic Shock Trial. Both authors drafted the manuscript and critically reviewed it for important intellectual content.